I recently added page management capabilities to this site (cms on sails), making it a fledgeling CMS. I used the same editor that is used by the Ghost blogging platform. You can find the source code on github. Using a popular library means you’ll find many other developers in the same boat. If you run into bugs or issues, you’re more likely to find help in their issue tracker or on IRC. Easy to set up, easy to maintain, easy to use for the end user. Clean and simple === good. At the end of the day, I’m going on a gut call. I didn’t prepare a fancy report or comparative analysis to decide what I’ll use. You should rely on my suggestions either — try out some editors and choose based on your own experience. TinyMCE is a WYSYWIG (What you see is what you get) style HTML editor. It’s very popular, and used by multiple well known corporations. I found it because it was the first result on Google. There are many plugins and extensions available for TinyMCE which you can easily find online. It’s also easy to set up. On the downside, it might be too much for your needs. Users on stack overflow complain that it’s slow and heavy. It offers many extra features you might not need. I personally avoided it because it doesn’t offer live preview — meaning you can’t see the rendered markup as you type. You have to click a button to see the output every time. At time of writing, I’m still using EpicEditor for the blog post side of the CMS. For simplicity and easier dependency management, I’m going to switch everything to the ghost editor soon. Ghost Markdown Editor is a stand-alone version of the editor used by the Ghost Project. Luckily, Ghost is open source, and the code base is released under a very permissive license. They have a beautiful website and blogging platform. If all I needed was a blog, I’d just run the self hosted version of their system (free). To anybody wanting to run their own blog, I recommend the hosted version of Ghost (5$/month) over anything else. it’s very sleek and easy to use. Ghost Editor is my favorite because of the live preview feature. You can see your markup rendered live, right next to where you type. The repository comes with a good example implementation, so getting set up is quite easy. Visually, the editor is definitely above average compared to most WYSIWIG editors). 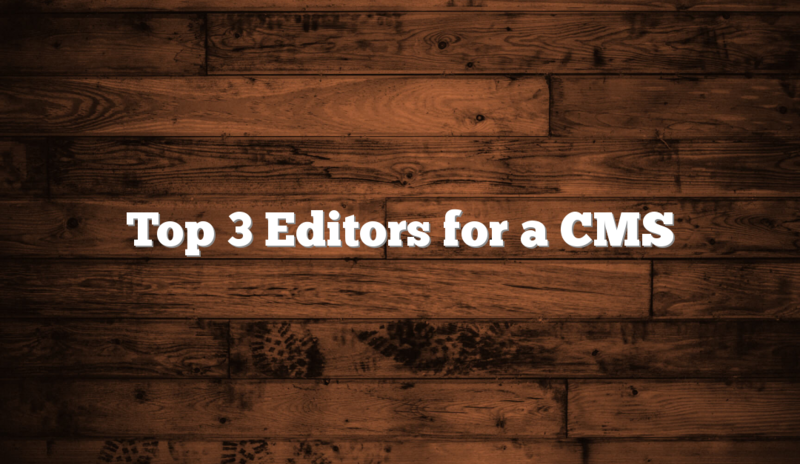 If there’s an editor you prefer over the ones I discussed, let me know in the comments, or contact me about it.